Europe, 1721. After years of a disastrous war between France and Spain, the Regent Philippe of Orleans agrees with King Philippe V to put an end to hostilities. In order to consolidate peace, he organizes an exchange of princesses: his daughter Louise-Elisabeth d'Orleans, 12, will marry King Philippe's teenage son, while Marie Anne Victoire, King Philippe’s four-year-old daughter, will marry the future Louis XV, barely 11 years old. The exchange completed, the two future wives acclimate differently to their new status. As soon as she is married, the rebel Louise-Élisabeth clashes with the future Spanish king and her in-laws. 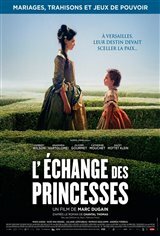 As for the innocent Marie Anne, she finds comfort with the former governess of Louis XV.